Note: this piece of commentary recently aired on This Way Out, the worldwide LGBT syndicated radio show. When I came out in 1982, I did so in the context of an alternative culture. I commenced on surrounding myself with a gay and lesbian community – I had a gay hair stylist (but, of course); and a lesbian chiropractor, doctor, and accountant. Nearly three decades (now how did that happen? ), I find that I am now, if not entrenched in the mainstream, at least strongly represented. Just looking at TV, that barometer of American life, I find that there are not just a few lame sitcoms but, in fact, an out lesbian who is an established financial advice guru; an another out lesbian who has a nightly political commentary show; and an entire LGBT cable channel. In my own life, too, I find myself becoming more assimilated. It’s not just about being gay any more, it’s about being gay in addition to everything else that we are. Our legal rights have not kept pace with our cultural assimilation but, still, things are easier than they were. For instance, I find that I am much more comfortable being out in my place of employment, rather than in – which, unfortunately, is not a choice that everyone can or will make. And I have noticed that others who are out in the workplace frequently bend over backwards to fit in. But as I move along in my journey of becoming more of myself, I am far more concerned with how to hang on to myself more than I am with assimilation. It’s easy to forget how we earned our hard-won strengths and I find sometimes that it’s convenient to even forget my own origins. One of the major ways that I have held onto myself is through reading and writing. There were many queer writers who influenced my coming of age – and one of the memorable ones is the late Audre Lorde, whose seminal book of essays Sister Outsider was reprinted by The Crossing Press in 2007. 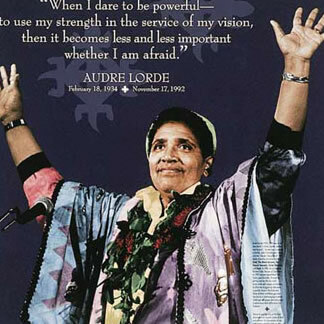 A self-described “black, lesbian, feminist, mother, poet warrior,” Audre died of breast cancer in 1992 at the age of 58. I remember sitting in those sessions with other women like me – women from working class backgrounds who were able to, and in many instances, expected, to hide our differences. One of Audre’s most widely quoted pieces of writing reads: My silences had not protected me. Your silence will not protect you.... and while we wait in silence for that final luxury of fearlessness, the weight of that silence will choke us. As I sat in the Eye to Eye session talking with 20 or so other women it felt like a new kind of coming home. So often we turn away from others who remind us of our own painful experiences. I found myself remembering another time in my life when this was true. One night when I had just come out and was in my early 20s, I had gone alone to the lesbian bar in the city where I lived. Toward the end of the evening, I found myself dancing slowly with another young lesbian. I liked this woman, or the little that I knew about her. I liked the way I felt in her arms. But, when I found out that she lived in the same tract house town where I had grown up, I backed away from her offer to go home with her. I could not conceive of going back to a place it had taken me so long to flee from. When I thought about where I had grown up, I thought about my girlfriends who had ended up dead or in jail. I thought about my two best friends who had married too young and were stuck in lives that were inconceivable to me. That night I turned away – but at the I Am Your Sister conference, I stayed and listened, I stayed and talked, and I broke my own silence. There is strength in memory. There is strength in knowing yourself and in speaking your own truth. What are the words you do not yet have? What do you need to say? What are the tyrannies you swallow day by day and attempt to make your own, until you will sicken and die of them still in silence? Perhaps for some of you here today, I am the face of one of your fears. Because I am woman, because I am Black, because I am lesbian, because I am myself – a Black woman warrior poet doing my work – come to ask you, are you doing yours?